This is an issue that comes up frequently in the area of kilnformed glass. Many times, work is made and put out in public, that other glass artists, gallery owners, collectors, or fans feel is too close in appearance to the work of other artists. 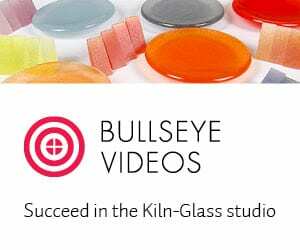 Frequently, classes given to beginners or intermediate glass artists begins with a discussion of this concept in order to put the information given in the class in perspective. I’d like to take some time to discuss this here, since it is a significant issue for both the person who is being copied, and the copier. Defining plagiarism can be tricky in the context of three-dimensional glass art. The dictionary definition is: the practice of taking someone else’s work or ideas and passing them off as one’s own. Clearly, making an exact replica of someone else’s work is out of bounds – yet that is exactly what often happens. Especially to teachers who show students exactly how they make their work. On occasion, the student will take that as tacit approval to venture forth and recreate what they learned in class. But, that is not what the teacher had in mind! What teachers want is for the students to master the technique, but create work that is their own. Is it ever appropriate to make exact replicas of other artist’s work? Yes, it is – but only as a learning process unique to the technique; and the end result needs to remain with the student, or as a gift to a family member or friend, with the explanation of exactly what it is. It is not appropriate to sell that work, enter it in competitions or charity auctions, or pass it off as original work. Another issue related to classes and teaching is plagiarism of the class content. It is not acceptable to take a class, particularly one taught by the originator of a technique, and then turn around and give that same class as the teacher yourself – unless you have the specific approval of the instructor. It is not acceptable to copy class materials and handouts and sell or distribute them to others, even if you don’t pretend it is your own original material. That is theft. What about creating work that is similar, but not an exact copy? That is just as off-limits, and the same rules apply. Unfortunately, this distinction can be somewhat fuzzy. Changing the color, or other details still does not make it original. At times, it helps to ask someone else to compare your work to someone who has been “an inspiration” and see what they think. But, if you have to ask – it is probably too close. So – how can you get “inspiration” without copying? Actually, that is easy if you have your own ideas, your own message, and your own experience. Today, with the internet it is possible to look at thousands of images in a single day on web sites, Pinterest, bulletin boards, Facebook, Instagram, and gallery web sites. You will find things that you like, but aren’t “you”. You will find other things that draw you in, and make you want to experiment with them. And, that’s exactly what you should do. Experiment. You might find that today, you are drawn to the color red; and things that are round; and wall pieces. So, you begin working on a piece that has those three characteristics, based on the images you reviewed – but adding your own personality. You make something, decide what went wrong, and what you like. And, then make another, and another – refining the design each time. Eventually, you will get it the way you want, and can start a series, or move on to other things. But, back to copying. If you do this, a few things will happen. -You will stop your own creativity in its tracks. -You will become a technician, rather than an artist. original artist. It will represent nobody. -The work will radiate that lack of personality. If you make work that is meaningful to you, it will be meaningful to others; if it is not meaningful to you, it will not be meaningful to anyone else. Also, other glass artists will see what you are doing, and very well may let the original artist know about what you are making. The original artist may give you their opinion as well, which usually isn’t pleasant. Artists doing original work look out for each other. This has happened to me many times, where I have been notified that someone has seen a piece of glass artwork that did not pass their test as being different enough from mine. The artwork has been seen in stores, on web sites, on bulletin boards, etc. My response has been to communicate with the artist directly, and explain (as I am in this article) my feelings on the issue. The response has been uniform apology, and thanks for the explanation. It is the rare person who wants to do this intentionally. On the other hand, when a company in China starts mass producing your work and selling it for a tenth of what you do – yes, that is intentional. Sorry! One way that artists attempt to work around this issue is to create work similar to another artist and label it a “homage”. Again, if it is an exact or almost exact copy, calling it a “homage” doesn’t get the artist off the hook because the “homage” label does not follow the work. On the other hand, if it has some similar elements, but also has its own creativity and message, some will find it acceptable. Again, it is a subjective determination. Is it possible to create something original and find out that someone has already done that? Sure. It’s also possible that someone will come up with something that you already created without seeing (or being aware that they saw) your work. This can create tricky situations, and sometimes it is difficult to accept that somebody came up with your original idea before you did. But this does happen, and both parties have to figure out a way to work this out. It is unusual that any artwork or any particular technique is completely new, and it is almost always possible, if one digs deep enough in the “archives”, to find something similar. So, the message here is make your own original work. If you copy something, keep it for yourself. If someone copies you, try to be understanding, create personal contact with them, and work things out. I understand that not everybody is amenable to this kind of collaborative resolution to the problem – but it should be tried first.